While the Zachman’s framework has a well established (and unparalleled) conceptual standing, its actual imprint on enterprise architects’ practices remains limited. That apparent deficiency could be explained by the limits of its tabulated representation, and disposed of by morphing lines and columns into embedded pentagons. Overreach: the universality and potential benefits of its core concepts may have been blurred by a number of additional constructs with specific semantics or limited applicability. Format: the tabulated representation with columns and lines prevents a clear description and understanding of the cross relationships between architectures capabilities. 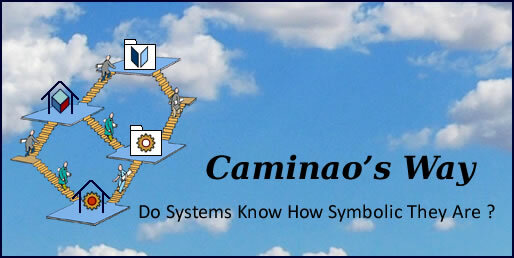 The Caminao framework may help to overcome these obstacles by focusing on Zachman’s core concepts and replacing columns and lines with embedded pentagons. Its clarity of purpose is arguably a strong point of the Zachman framework as it can be defined by six columns and five lines. But the arrangement comes with some discrepancies as it mixes architectures artifacts (lines 2-4 and columns 1-5) with contexts, instances, and purposes. Contrary to the first five columns, each characterizing a capability, the last one is about the objectives to be achieved by the architecture as a whole; hence the need of setting it apart of the primary capabilities which can then be represented by a pentagon. Regarding the lines, the distinction between scope contexts and business concepts is less contingent on architecture than on business strategy. Moreover, there is a conceptual difference between what can be defined by enterprise architecture and what is defined by the environment (more on that below). Likewise, platforms and tools technologies are better understood as a homogeneous layer, at least from an enterprise architecture perspective. Finally, if the bottom line for operational instances falls outside the description of architecture artifacts, it is to support the definition of acceptance tests. The primary objective of an EA framework is to provide a comprehensive and consistent cross description of the whole of systems architectures; yet, the benefits of Zachman’s clarity of concepts may be frustrated by the specific formalisms of diagrams used at the junctions between columns and lines. A geometric representation of clear-cut capabilities and homogeneous layers could do away with proxy diagrams, unveiling a backbone of architecture artifacts unfettered by a medley of modeling notations. That representation would open the door to built-in transparency and traceability mechanisms across horizontal (capabilities), vertical (layers), and transverse (capabilities and layers) perspectives. Instead of a cumbersome and ambiguous accumulation of manually defined connectors (‘verify’,’satisfy’, ‘refine’, ‘sub’, ‘trace’, ‘derive’, …), the semantics of most of the dependencies could be unambiguously induced from context. The generalization of digital environments renders obsolete the traditional distinctions between enterprises and their business context, which means that software engineering must be integrated with the design of business processes. That implies a change of perspective for the Zachman’s sixth (“Why” ) column, with the vertical (architecture) perspective replaced by a horizontal (business value) one, the “Why” column becoming a line set across enterprise architecture capabilities. With a pentagonal representation, that line would appear as circling the outer range. Taking advantage of the built-in traceability mechanisms mentioned above, business processes could be rooted in value chains and designed alongside supporting applications. The integration of business and engineering processes is not necessarily a one-to-one affair as key business functions are meant to be shared across business processes. That objective is best achieved with service oriented architectures (SOA) and a clear distinction between enterprise (for specific business processes) and functional architectures (for shared business functions). From enterprise to service capabilities. Contrary to the silo perspective of a tabulated representation, using pentagons would help to align functional capabilities with services. Whatever the assorted labels (based/driven, system/software, development/engineering,…), the basic tenet of model based system engineering (MBSE) is to define engineering processes in terms of artifacts (models or code) transformations. Given its formal and comprehensive description of systems artifacts, the Zachman’s framework should have provided a sound basis for MBSE. That it didn’t happen is all the more intriguing that MBSE implementations have been mostly limited to the last step of engineering, i.e model-to-code transformations, and could have benefited from a broader methodological basis. To begin with, given that enterprise level modeling remains a matter of customary practices, there isn’t much contents upstream to feed MBSE with, whatever the representations. Nonetheless, assuming some enterprise architecture models, tabulated representations will suggest (if not enforce) injective transformations along columns; that may be fine for standalone applications but certainly not for architectures which are supposed to articulate shared assets with specific processes. That hindrance is eliminated when columns and lines are replaced by pentagons. That simple transformation significantly improves the transparency of enterprise architectures while bringing a new light on dependencies set across layers and capabilities. As it happens, and not by chance, it neatly fits with the Pagoda architecture blueprint and pave the way to enterprises digital transformation. Ubiquitous, massive, and unrelentig digitized business flows cannot be dealt with lest a clear distinction is maintained between raw data acquired across platforms and the information (previously data) models ensuring the continuity and consistency of systems. Once structured and refined, business data flows must be blended with information models sustaining systems functionalities. A comprehensive and business driven integration of organization and knowldege could then support strategic and operational decision-making at enterprise level. That blueprint can be much more than metaphoric: applied to enterprise architectures it would greatly enhance the traceability of transformations induced by digital environments. Like the sixth “Why” column, the bottom line for operational instances is not about architectures. But when set on the outer range of pentagons operational instances would point to their role as a basis for “Why” associated tests cases. Instances provide the cases for unit, integration, and acceptance tests. Depending on layers these instances could be used for unit, integration, or acceptance tests, either specifically or across capabilities. They could also be used to test the quality of service (QoS). Size and complexity of the problem at hand independently of supporting systems (business requirements). What is expected from supporting systems with regard to business requirements (functional requirements) and quality of service. Constraints on implementation (technical requirements). Who: users, user’s entry points, users’ interfaces. What: conceptual, logical, and physical models. How: business logic, use cases, transactions. Assessing requirements with regard to capabilities could significantly improve costs/benefits analysis and decision-making. Comprehensive and consistent descriptions of managed organizations, processes, and systems. Partial and conjectural descriptions of external business environments. Using profiled ontologies to describe scope contexts will help to align knowledge management with EA governance by setting apart ontologies defined externally (e.g regulations), from the ones set through decision-making, strategic (e.g plate-form) or tactical (e.g partnerships).